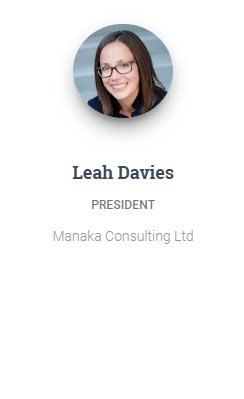 Leah is the President/Well Abandonment Specialist with Manaka Consulting Ltd. Previously, she worked in various positions including Abandonment Technologist with the AER (when it was known as the EUB), and Abandonment Compliance Coordinator with Canadian Natural Resources Limited. She graduated from SAIT in 2001 with a diploma in Petroleum Engineering Technology and from U of C in 2015 with a Bachelor’s of Science degree, majored in Physics. In her personal time, Leah enjoys yoga and wine. She is married with a super awesome son! 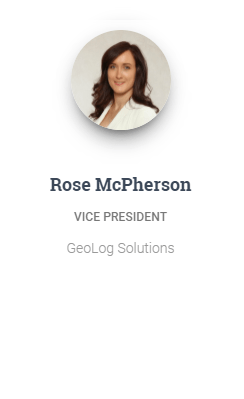 Rose is currently working as Business Development and Technical Services Lead for GeoLog Solutions Inc. Geolog’s state of the art cased hole formation evaluation technology, the Cased Hole Analysis Tool (CHAT) is used to accurately identify sources of surface casing vent flow leaks. Previously, Rose worked with Weatherford’s Abandonment team as as lead in business development for their noise detection tool – the Geophone Array Production Survey (GAPS), which is another tool that’s used to identify sources of fugitive gas migration in the well bore. Rose graduated with a B. Sc. in physics from the University of Calgary in 2013 and joined GeoLog’s team in 2018. With five years of experience in data analysis and log interpretation, she builds intervention strategies to effectively remediate leaking wells. Rose is currently a member of CWLS, SPE, and sits on the Executive Committee for the WIA Society as Vice President. Blair has been a Do-er of Stuff at West Lake Energy (formerly Twin Butte Energy) since October 2014. Prior to this, he was a Completions Engineer at Talisman Energy and a Process Engineer at Shell Canada. With over 9 years of completions experience ranging across the Western Provinces, Blair has had the opportunity to work on over 1000 wellbores and over 500 abandonments and suspensions. The bulk of these wells have been in the heavy/medium oil corridor between Cold Lake and Shaunavon. In spite of his lack of grey-hair, Blair has taken a penchant to the art of Surface Casing Vent Flow and Gas Migration intervention. He also performs end-of-life & repair operations and enjoys the technical challenges of this work. When not shutting off vent flows, Blair likes to coil-frac horizontal wells and help find by-passed pay. He has no interests outside of work, so don’t invite him to parties. Joel is currently a Solutions Representative at Roke Technologies. His focus at Roke is on data analysis for wells with surface casing vent flow and gas migration issues. Prior to this Joel worked as a wireline supervisor in Canada and helped establish operational bases in Russia and Malaysia. A member of the CSGM/WIA Society since 2013, Joel has enjoyed watching the group grow and looks forward to contributing to their continued success. Michael is a Technical Service Representative for Matrix. Matrix offers ASAP Resin which is a cement alternative that is for unique wellbore integrity and abandonment applications. Michael is passionate about helping operators repair producing assets, clean up liabilities, and is currently working on new resin-cement blends to address long standing industry challenges. Previously, Michael worked with Savanna Energy Services in the field, before moving into the office in business development and procurement. Michael graduated with Economics from Union University in Jackson, Tennessee and joined the industry in 2012. 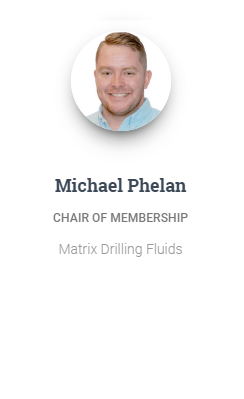 With six years of experience in the field, operations and business development Michael is currently a member of the SPE and sits on the Executive Committee for the WIA Society as Chair of Membership. On days off you will find Michael fly fishing, golfing and playing hockey. Mark Soper, P.Tech.(Eng.) is a Director of WIA Society. He has been a member for 4 years, and has served as a Director for 1 year. Mark graduated from SAIT in 1984 with a diploma in Petroleum Engineering Technology. He has a combined 35+ years of industry experience.He has been the Abandonment Coordinator since 2012 and also acted in the same capacity with Esso Resources from 1991-1994. Prior to his current role he was with the Conventional Asset Optimization Team from 2009-2012. Before that he worked for 7 years in Jakarta Indonesia as the Operations Engineer for the Ogan Komering production area in South Sumatra. He worked in Calgary Drilling and Completions for 4 years before moving to Indonesia and prior to this was with Pembina Resources Ontario for 3 years as the Area Superintendent Offshore before Talisman purchased Pembina in 1998. He also spent 8 years with Esso Resources in various operations roles as well as working on Service Rigs and Cased/Open Hole wireline services prior to that. Mark is a Professional Engineering Technologist registered with the Association of Science and Engineering Technology Professionals of Alberta. In his spare time Mark enjoys golf, skiing and riding his motorcycle. I was born and raised in Calgary and completed the Petroleum Engineering Technology program at SAIT. Shortly after graduation, I joined an Engineering company specializing in high temperature downhole instrumentation. After gaining years of field experience, I eventually joined Encana as part of the Clearwater completions group. Initially focusing on completions for the Toyota joint venture, my role diversified into workover and abandonment operations for the business unit. Encana eventually sold the asset to Ember Resources and along with the land came 50 staff. I currently handle the completion, workover and abandonment operations at Ember. In my spare time I try to get out golfing, get on the dirtbike or get some airtime in a small Cessna.